What defines a “comfort” dish? Sentimentality, based on good home cooking? Texture? Ingredients? Process? Rustic presentation? I can’t quite put my finger on it. This particular dish qualifies, but perhaps anything with the word “stuffed” in its name stacks the deck a little too steeply in its favor. It is interesting how a word so derogative when applied to humans becomes so delightful when applied to food. As I mentioned the other day, Gourmet Worrier’s recipe for Qarabaghli mimli bil-laham caught my eye. I ran with the concept, and created my own version, which combines ground pork shoulder, some nicely smoked bacon, aged asiago cheese, breadcrumbs, crème fraîche… oh nevermind, the recipe is below the fold! Step 1: turn your zucchini into little boats. 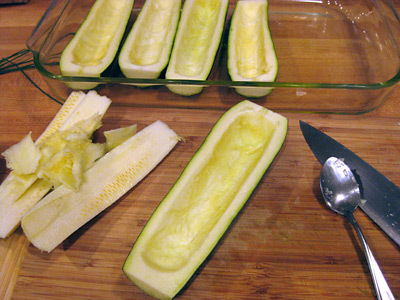 Chop off the ends, halve them, and lightly run the knife down the sides of the zucchini as if you were de-seeding it, but stop with the knife before you get to the end. Using the knife is optional but it makes things a little easier, for the next step is to carve out the hollow of your vegetable canoes with a teaspoon. Put the center parts of two of the zucchini halves aside for this menu, and save the rest for something (like ratatouille, see end of post). Make some breadcrumbs by removing the crust from an older loaf of bread (I used a sourdough bagette here), and breaking down in the food processor. Spread the breadcrumbs out on a small baking tray, scatter some dots of butter, and bake at 350F until just golden brown. Reserve. Leave the oven pre-heated at 350F. Cook your bacon in a large saute pan until almost crispy then chop up and put to the side. Remove most of the bacon fat and saute the onions on medium low heat for a few minutes. Turn up the heat to medium and add in the ground pork, sauteing until lightly browned. Add in the vermouth and cook for a few more minutes, then stir in the ramp greens, red pepper flakes, parsley and bacon. Cook for a few more minutes and turn off the heat. Stir in the asiago cheese and taste for salt and pepper. When you are happy with the seasoning, beat an egg in a separate bowl and stir it in. If you have a grill, I highly recommend rubbing a little olive oil on the “cut” side of the zucchini and searing quickly on the grill top. Partly this is for aesthetics, but for the final presentation I was wishing I had been able to take that step (my grill needs some fixin’). Place the zucchini halves on a baking dish, and rub the bottoms with some olive oil (depending on the size and number of zucchini, you might need two — I did). Scoop the mixture into each of the canoes. Drizzle some olive oil around the edges of the zucchini, and sprinkle a healthy amount of breadcrumbs over each one. Bake in the oven at 350F for about 50 minutes. The crème fraîche sauce makes this dish, so you do not want to skimp! Take about 8 ounces of crème fraîche, and thin it slightly with some lemon juice. Add in a pinch of ground nutmeg. When you serve the zucchinis, generously spoon the sauce on top, and then scatter some lemon zest, freshly chopped chives, and freshly chopped parsley on top. This goes nicely with a simple side salad and a full bodied white wine. 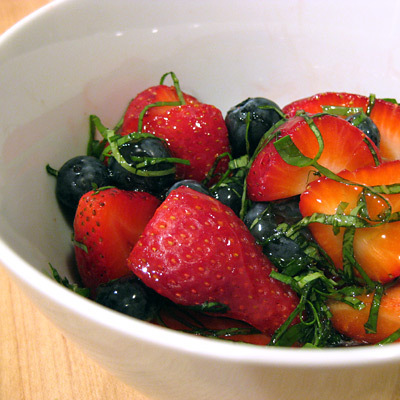 We finished off the meal with some strawberries and blueberries coated in honey and a chiffonade of fresh basil. Zoe reminded me how much I liked this simple desert. Honey and basil together transform into something new and delightful. I thought I would also append this post with a simple dinner that is not worthy of it’s own post. After reading Stacey Snacks and Tartelette, I had to cook up a ratatouille. Mine had its own touches but was pretty basic, so I won’t repeat a recipe here. I sliced up some cold beef (from a gorgeous porterhouse steak we grilled the other day, but a grilled, cold london broil would work too), and served it with a pesto-like green sauce. The sauce was created by combining parsley, basil, half a garlic clove, lemon juice, capers, pine nuts, olive oil, hot red pepper flakes, a small amount of salt and pepper, a touch of white wine vinegar — all mashed together to taste with a mortar and pestle. We served this with some pickled ramps, and a chilled pinot noir. 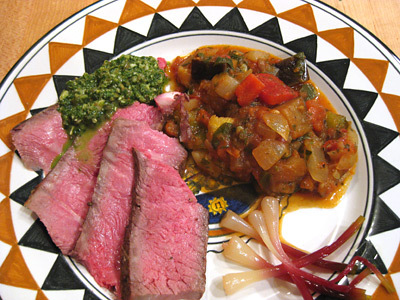 I really enjoyed this meal because it worked for a hot evening, with the ratatouille adding substance without heaviness, and the sharp sauce adding a contrast that worked well with the cold beef. As usual, my plating skills left something to be desired, but that is a skill I have yet to conquer. I want all of it – from the stuffed zucchini and strawberries and basil to the “Summer leftovers.” It all looks tempting. Giff, I love any stuffed vegetable. I have never thought of adding pork to the mixture. 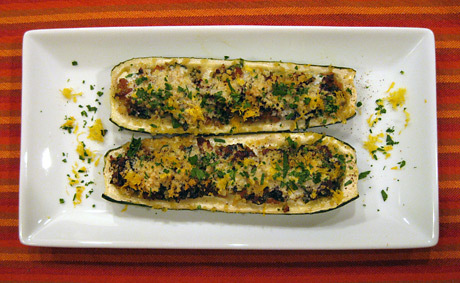 Wow, that stuffed zucchini looks & sounds amazing! I can see this filling in a winter squash too. Now I’m craving this…..
That looks like a wonderful way to eat zucchini. You can’t go wrong with pork. I like what you had to say about comfort food. It’s a hard thing to put your finger on, isn’t it? I would say for me it’s about texture, and can vary from mood to mood. in all honesty, i absolutely marvel at how creative your recipes are. each of them is unique. Bee, that comment means a lot to me! This menu is pure summer. I am planting a garden that will one day produce zucchini a plenty and this will be the first recipe I turn to. Thank you for the mention, I’ll be trying your version soon! This is very creative and the sauce sounds delicious. so glad to see someone using creme fraiche – an ingredient so underused here in the States, in my opinion. Funny, my next blog post uses it too. 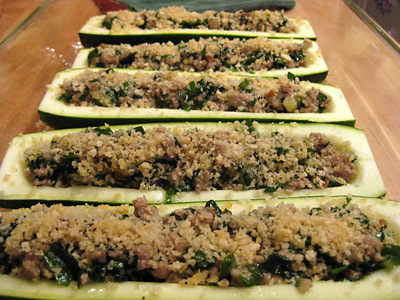 Love what you are doing here, love the stuffing mix (never stuffed zucchini with pork before! ), and the sauce sounds great – gonna try that with a couple of different things actually. What an interesting dish! So versatile too … but this combination sounds great. NExt time I find good zucchini I will definitely try. I also think stuffed zucchinis would go *really* well with lamb! The zucchini recipe sounds really delish. Ours aren’t anywhere near that size, though, so I’m thinking a layered sliced version would work for me. The ground lamb I have in the freezer would be perfect I think, so thanks for the suggestion ; ) And I agree with you on that fruit salad. Have you tried it with a balsamic reduction? Oh, my. Hi Kelly, well Haalo just blogged about stuffed zucchini’s as well, and says she prefers the smaller ones anyway, which authors like Richard Olney agree with. I just happened to have medium/big ones, but did not have a problem with the taste, so figure working smaller might be a little more fiddly, but there’s only a taste upside! Great idea Giff, I’ve experimented with stuffed zucchini and haven’t been too happy with the results, but I think my problem was that I was trying to make it vegetarian. With bacon and pork shoulder, I bet this is fantastic!